How to choose the best running shoe? WHERE TO BUY RUNNING SHOES: If you are reading this, you have probably been disappointed with your shoe choices in the past. Before you make your next purchase, here are some things to think about to get the best from your new purchase. There can be a huge difference between the stock, knowledge, helpfulness and profit margins between stores. Specialist running shoe shops run by the local running fanatic will usually be stand alone stores and therefore more expensive but with better quality advice. Large chains will have a shoe fitting training programme which is (probably) reasonably good and experience does count. Many podiatry students fund their way through university working in such places, they can also provide valuable insight. ‘Discount’ outlets will generally be cheaper but usually at the expense of an experienced fitter. Consider what purpose you want these running shoes to fulfil: Clarify in your mind what activity you are planning to do in the shoe. Your needs will be very different if you are running marathons or doing the shopping. To run, buy a running shoe. To walk or wear casually, buy a running shoe. For tennis, basketball, cricket, football, etc – look to a sport specific shoe. Be prepared to discuss the type of running, distances and surfaces you anticipate. If you use only flat surfaces like a running track or a shopping mall, you will need a different stability / cushioning ratio than you will if you run over fields or canted road edges. 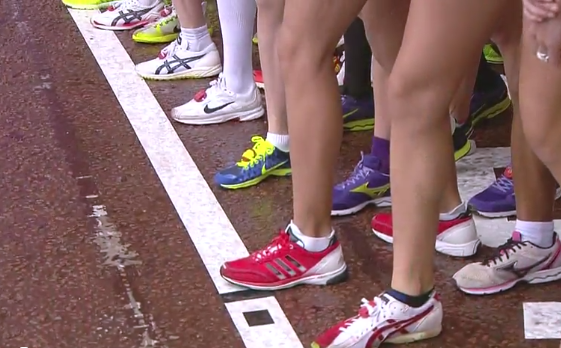 Generally, cushioning and stability are a trade-off of one another. 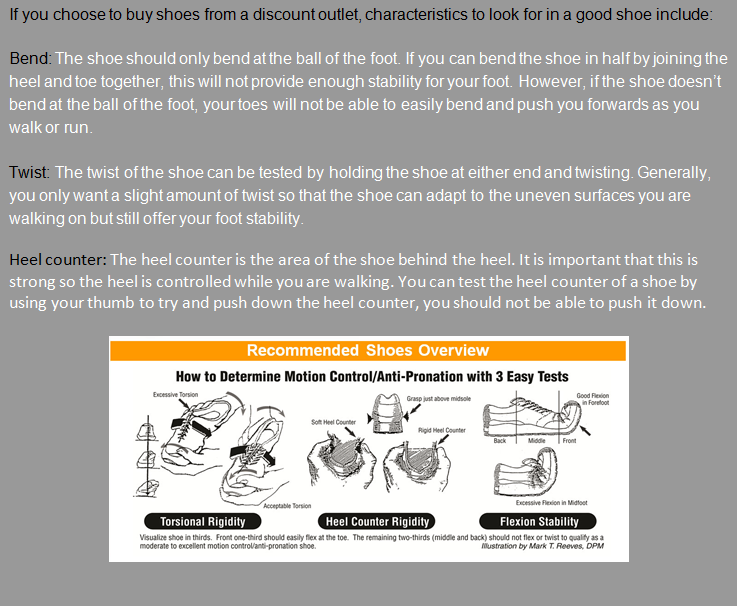 If a shoe has maximal cushioning it will also have instability, and vice versa. You need to think about the needs of your own body, do you have very pronated feet that need stability and control, or do you have osteoarthritis and need cushioning for your joints? FIT: Your primary need is for a pair of shoes that fit well and feel comfortable. Fit and feel are certainly an individual decision, but look for running shoes that fit snugly (without being tight) with about a 1.5cm (or slightly less) room between the longest toe and the end of the shoe. Your toes should not feel cramped or squished. Your heel should not slip in the rear of the shoe when walking or running. If one aspect of the fit is not right, don’t buy the shoe. WIDTH: If you like a certain shoe, but don’t feel it’s wide enough (or it’s too wide), ask the salesperson if it’s available in more than one width, many models are. New Balance offers all of its best running shoes in at least three widths for both men and women. Some brands (but not all) offer one or two widths in popular models. If you are a woman who is having trouble finding a wide enough shoe, try a men’s shoe as they are made wider for the same length. COMPARE: Try on a wide variety of styles and brands. One brand isn’t necessarily better than any other. Take your time. 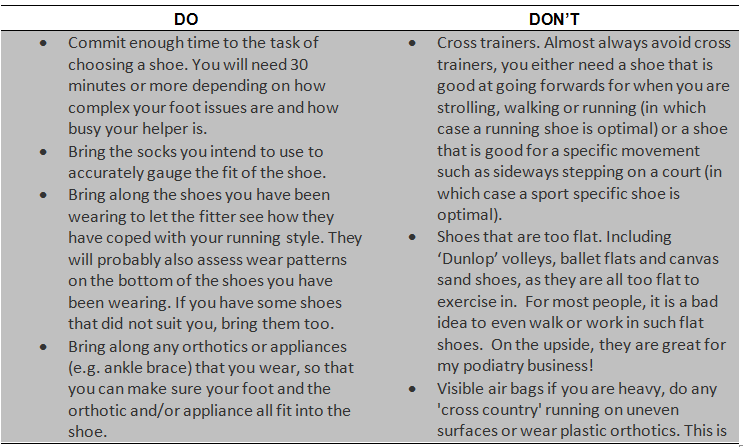 Put your running socks on (and if you wear orthotics, place them in the shoes) and walk around the store in the shoes. Jog around outside. If it doesn’t feel or fit right in the store, it won’t feel better when you run (just the opposite).Make certain the salesperson watches you run. There are some shoes that could be wrong for you, for example, not enough support if you can’t tell, the salesperson should be able to. Decide on two pairs and compare the two on fit and comfort. Ask the salesperson what the technical differences are between the two. Put one shoe from each pair on and jog around to see which shoe feels better. Go with that shoe. If you can’t discern a difference, ask for the salesperson’s recommendation. RETURN POLICY: Ask about the store’s return policy. Most good running stores have a liberal policy which allows you to return shoes that are clean and have not been worn a great deal. But check and always keep the sales receipt.